The price up 20% after posting on 9 May. 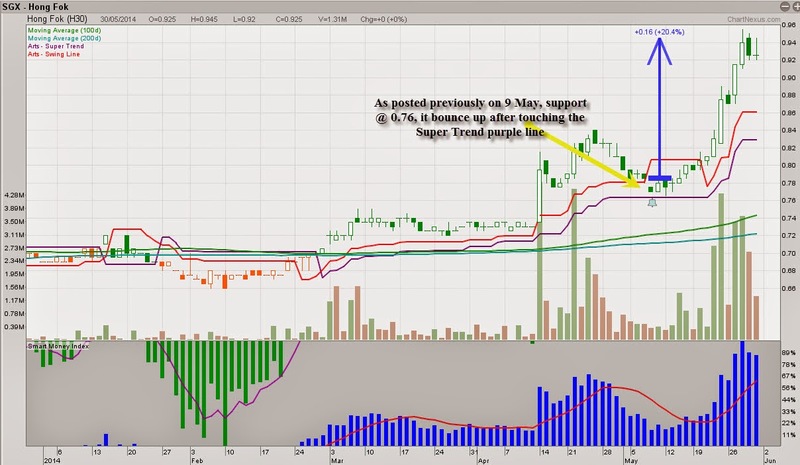 Super Trend system we use it to identify stocks that move near or retrace to support level, once it price touch the purple line we will enter near support level @ 0.76-0.77 and place stop loss below support level 0.74-0.75, with this plan it put us in low risk and high probability reward ratio. Don't you want to catch this kind of stock? KrisEnergy - Will it break out ? Ying Li International - Recover from the bottom? Indofood Agri - the strength is weakening ! Rex International - will it breaks out ? Grand Banks, sound like bank stock? BreadTalk and GuocoLeisure are still in play ? Wing Tai - at support level? Pacific Radiance continues to move higher ! Maxi-Cash Chart Trending up again? Oxley - Uptrend still intact? Tat Hong - Potential to move higher? Centurion : Still in play ? China Env and Sunvic : Turning Down ? Oxley : Turning Up again ?